ubin Antalia from Mumbai has won the inaugural Maruti Suzuki-Autocar Young Driver contest, beating 32 other competitors from across the country. Maruti Suzuki-Autocar Young Driver 2009 is a nationwide search for India’s best young driving talent. This competition tested the competitors’ knowledge of traffic rules, awareness of road safety along with their real-world driving skill. The contest was open to all individuals, between the age of 18 and 30 years, with a valid driving license. The two-month long contest – held across 12 cities with over 4,000 participants – reflects Maruti Suzuki’s efforts to mobilize young drivers to create safe driving awareness. The competition is a part of the company’s National Road Safety Mission, which was launched in December 2008 to impart driving training to at least five lakh people in the next three years. At the national finals of the Young Driver 2009 contest, held at the Institute of Driving Training and Research (IDTR), Sarai Kale Khan, today, thirty-three contestants showcased their driving skills on the test tracks of the institute. While giving away a brand new A-star as the grand prize, Maruti Suzuki India (MSI) executive officer (Marketing and Sales) Mayank Pareek said that India is the number one nation in the world in road accident fatalities with over one lakh deaths every year on our roads. Around 78 per cent of these accidents happen due to the drivers’ fault. The country suffers from low awareness on the need for quality driving training and lack of modern infrastructure for the same. Maruti Suzuki has been actively introducing world class driving training and infrastructure across country through Maruti Driving Schools and IDTRs. 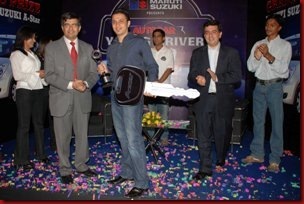 Young Driver Contest is one more step to create awareness among the general public. The Young Driver 2009 contest was held in three phases. In the first phase, competitors had to register for an online theory test on traffic rules, awareness of road safety and knowledge of their cars. Of the 4,031 contestants, who had participated at this stage, around 1,000 contestants were short-listed for second stage conducted at 16 Maruti Driving Schools across 12 cities and 2 IDTRs at Delhi. However, the list was further whittled down to only 654 people. They went through the next stage of theory and practical test on the driving simulator. The top 33 contestants among them were declared as qualified for the final stage of the contest. During this final stage of the evaluation which took place this morning at the IDTR, Sarai Kale Khan, the contestants underwent an actual driving test under the keen eye of Maruti Suzuki’s driving instructors and judges from Autocar India. Contestants were evaluated on parameters such as smoothness, vehicle control and presence of mind during emergency situations. Maruti Suzuki has already trained around 450,000 persons in safe driving in the last few years. Through the National Road Safety Mission, the company plans to train an additional 500,000 people in safe driving in the next three years across India. Of the 500,000 people to be trained, at least 100,000 will be people from the underprivileged section of society, who are keen to take driving as a profession.Maruti Suzuki contributes towards road safety through its Institute of Driving Training and Research (IDTR) and Maruti Driving School (MDS) initiatives.